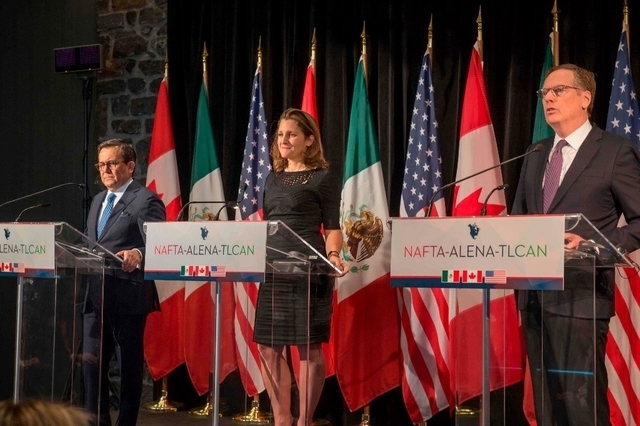 MEXICO CITY (AP) — Mexican and Canadian officials said Wednesday that talks on the North American Free Trade Agreement will remain a three-way negotiation, despite suggestions by U.S. President Donald Trump that he might pursue separate trade deals with both countries. “While the ultimate deal will be trilateral ... it’s completely normal to have a bilateral meeting,” Freeland said. Freeland said Canada also opposes a “sunset” clause proposed by Trump that would allow countries to opt out of the pact every five years. Mexico shares the position that such a clause would hurt longer-term investment. Freeland also met Wednesday with Mexican President-elect Andres Manuel Lopez Obrador, who will take office on Dec. 1, and several of his aides. In an afternoon conference call with journalists, Freeland said she believes the Liberal Party government of Prime Minister Justin Trudeau and that of the leftist Lopez Obrador will find “very productive areas of collaboration” on a number of issues, including but not only trade. “I feel that the strong, effective collaboration we’ve had with Mexico hitherto on NAFTA is set to continue,” she added.